For me this has been a summer of eating and sleeping in the middle of nowhere. By that I mean discovering remote hidden gems where you can eat and sleep – otherwise known as hotels/inns/restaurants with rooms. Biniarocca is a divine, charming 18-bedroom boutique hotel in Menorca, with a really good restaurant. 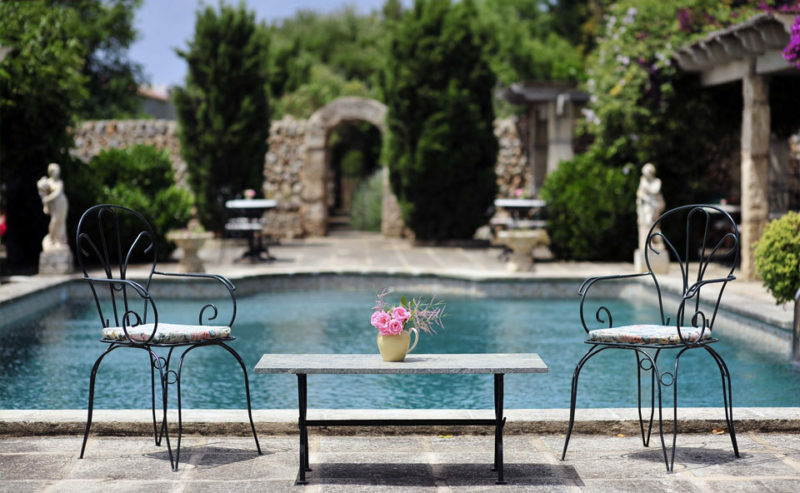 The place is as pretty as they come – an old white-rendered stone farmhouse with lots of original features, gardens with winding walkways, reading nooks, clambering bougainvillea, antiques and classical stone statues all juxtaposed with quirky patterned cushions everywhere – even on the sun beds! (Lots of the cushions are in leopard print. The owner of the hotel is a designer, and she is clearly way ahead of the trend hitting the fashion catwalks right now!) Absolutely perfect for a girly trip with my daughter, which this was, and equally perfect for a couples’ retreat. Dinner on the covered stone terrace is a treat. A pretty white clothed table for two scattered with petals; wrought iron chairs with cushioned seat pads. An interesting yet unpretentious menu with a definite French influence features starters such as salmon tartar with tartare sauce (a genius combination which we both went for) and ‘puff pastry bread’ which is soft and pillowy. The caramelised onion tartlet with melted goats cheese wafted past me on its way to another table, giving me serious food envy. My mushroom risotto with asparagus and truffle oil had a wonderful depth of flavour created by sobrasada (spicy and very salty sausage). My daughter tucked into a sumptuous confit of duck with dauphinois potatoes and a carrot, ginger and orange sauce. Everyone always lets me down when it comes to dessert – leaving me to be the only indulger. I cannot say no to a creme brûlée, and it was as good as they come. We had G&Ts made with the locally distilled Xoriguer gin and shared a surprisingly good and very reasonable (14 euros) Spanish rose. Dinner came to 100 euros for the two of us (but I put it on the room, which never feels like you’re actually paying for it!). Lunch poolside is a treat too, with a varied of menu of lighter and heartier dishes. Boquerones, squid ink pasta with prawns, glass of cava… and then a maximum of 10 steps back to the sunbed. Happy days! « Previous - SCHOOL’S OUT… TAKE THE KIDS OUT!